We’re lovin’ the look of the new Color Wash natural Bone Trappers in what we are calling our “Stained Glass” Series! Glass has been with us since antiquity and our infatuation with it—especially stained glass— continues to this day. Long before the Common Era, glass existed. Archeologists have dated artifacts made of glass all the way back to 3000 BCE. Romans citizens saw, within the first century of the Common Era, the advent of glass windows. Stained glass windows are believed to have first been introduced in Jarrow, England. Enamel was applied to glass in the monastery of St. Paul and from there it evolved from basic geometric shapes and symbols to large, ornate depictions of saints and their acts. Found even now in cathedrals across the USA today, stained glass still fills us with a sense of majesty and awe along with a sense of the divine around us. 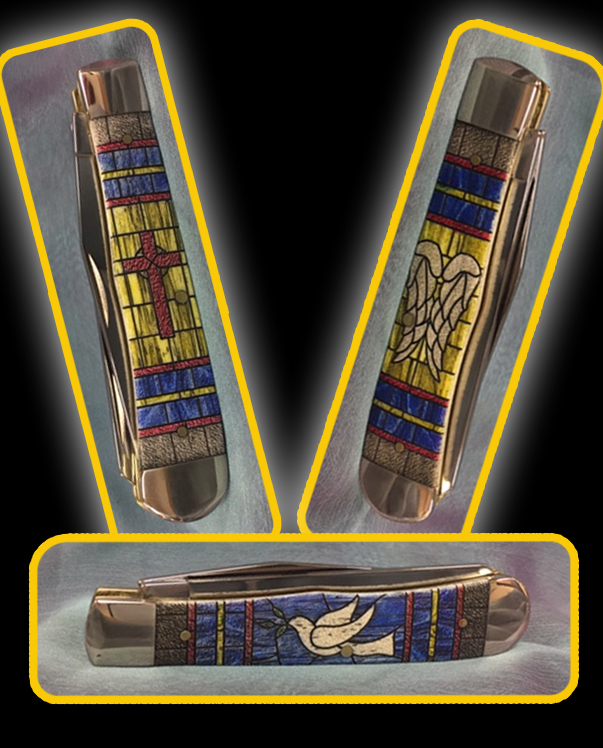 The Color Wash Natural Bone Trappers of the Stained Glass series intends to put a bit of that majesty and awe in a form you can easily carry in your pocket. 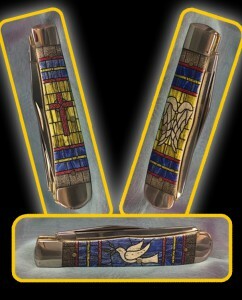 The series offers three different trappers, each with a focal point on one of the following: a Dove, a Cross, or a pair of Angel Wings. They’re bright, uplifting, and very different than anything we’ve done before.